Everyone knows Apple is incredibly profitable, but did you know that the top-earning tech company brings in more money than Hewlett-Packard, Google, Intel and Cisco combined? 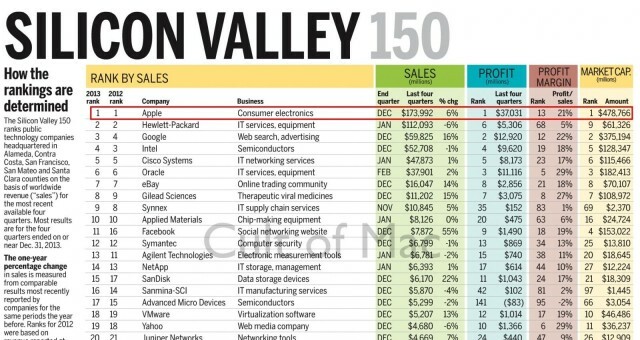 That’s according to the San Jose Mercury News’ newly published Silicon Valley 150 list, which ranks 75 tech companies using data from Bloomberg and U.S. Securities and Exchange Commission filings. The list shows that, at $174 billion per year, Apple brings in more revenue than second-place HP and third-place Google combined, while raking in more profits ($37 billion) than the rest of the top five taken together. According to a recent infographic, Apple earns an incredible $325,000 each minute.